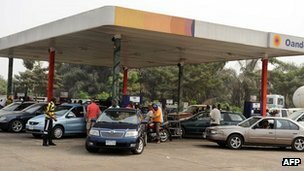 President Goodluck Jonathan has announced an immediate drop in the price of fuel, following a week of strikes and protests in Nigeria. Goodluck Jonathan said the price would drop by around 30% in recognition of the “hardships being suffered” by people. Nigeria has been paralyzed by strikes and protests over the government’s decision to scrap fuel subsidies. The removal of subsidies from 1 January caused petrol prices to rise from 65 naira ($0.40) to 140 naira. The unions have yet to respond to Goodluck Jonathan’s announcement. Earlier, they called off street protests due to security concerns, but warned that a week-long general strike would continue. President Jonathan has admitted there has been a near breakdown in law and order in parts of the country as a result of the strike. Army checkpoints have been seen in parts of the commercial capital Lagos for the first time since the protests began. The strike has already cost the economy billions of dollars in lost revenue. “Government will continue to pursue full deregulation of the downstream petroleum sector,” Goodluck Jonathan said in a televised national address. Goodluck Jonathan’s speech comes after a weekend of talks with the unions failed to prevent the strike from continuing into a second week. Abdulwaheed Omar, president of the Nigeria Labour Congress union, said he would urge his members to “stay off the streets… because of the security situation” but stressed the nationwide strike would continue. Protests over five days last week led to the deaths of several people. Some 600 people were wounded, according to the International Red Cross. The removal of fuel subsidies on 1 January was a devastating blow to the large number of Nigerians who live in absolute poverty. The authorities say the subsidy was costing the equivalent of more than $8 billion a year, arguing that the money would be better spent on infrastructure and social services.